For a book blogger, I post surprisingly few book reviews. I know, right? Sue me. America was all that Teo and Emilia knew -- brought up there by their fighter pilot mothers, it was the only home they'd ever had. But when Teo's mother Delia is killed in an accident, Emilia's Momma acts on Delia's lifelong dream -- to fly in Africa. With Teo as her foster son, she moves them to Ethiopia as the 1930s begin. But with war brewing, the family's previous problems of race, nationality and gender will soon be dwarfed by bloodshed and fighting. I have read Code Name Verity and Rose Under Fire -- Wein's two WW2 novels -- and LOVED them. 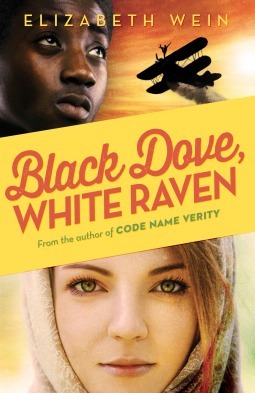 As such I bought Black Dove, White Raven soon after it came out, and reading it was just the delight I imagined! Emilia and Teo are the book's two narrators -- it is written in the form of their flight logs and journal entries. They both had wonderful strong voices, and I loved their relationship; one of my favourite things about Wein's novels is that she focusses on the platonic rather than the romantic, and Em and Teo had a great bond as brother and sister. They gave a freshness to the narrative that kept me turning the pages, and as a historical novel the book was incredibly interesting. I knew nothing about the way WW2 affected Ethiopia, and it was amazing to learn. All in all, Black Dove, White Raven was an excellent read and I'd highly recommend it. Catherine dreams of a life as romantic and exciting as the gothic novels she reads. Aged eighteen she goes to Bath for the first time -- her debut introduction into society -- but in a world of balls, friends and appearances, she must learn the difference between fact and fantasy: and the dangers of those who claim to want her heart. After a distinct lack of Jane in my life -- it's been over a year since I read Persuasion! -- I was really hankering to read an Austen novel. Northanger Abbey did not disappoint: a lovely short, sweet book in true Austen style. 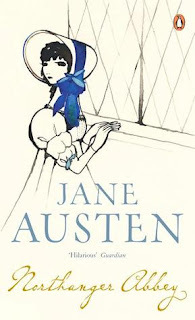 Whilst Catherine wasn't my favourite heroine, she was genuine and likable, and I LOVED the theme of books-within-the-book; Austen was gently mocking those who think of contemporary fiction as being not highbrow enough! I think it's so cool that, even in her day, this was a problem she felt the need to address ... and it makes me think, people who hate on YA and use Austen as their standard probably haven't read Northanger Abbey, or they might think differently! Catherine, the heroine, loves reading gothic and "sensationalist" novels and Austen really condones this, which I love. She also makes fun of cliched tropes regarding romance and a woman's role in society, as well as her relationship with men, which was awesome. Though I didn't love the romance as much as that in Emma or Pride and Prejudice, the ship was highly shippable and the plot very enjoyable. I felt that it was a little rushed toward the end, but that's my only criticism of an overall lovely book. Adarlan. The glass palace of the king. Celaena Sardothien is back. I was getting increasingly excited about Crown of Midnight. I didn't think that Throne of Glass was amaaazing, but I still really wanted the sequel ... and I LOVED IT! Crown of Midnight was worlds better than Throne of Glass. It was a rollercoaster and a heartbreaker, and it had me gripped from start to finish. First things first: I have become an intense Chaolaena shipper. I have to give Maas the credit, though -- her love triangle is developed in all its pointy perfection -- but, wow, Chaolaena. They have ripped out my heart and splattered it across the walls. The other perfect thing was the ending: it had me gasping, spluttering, bending over the book like a very stunned sparrow. * On reflection I should have worked some stuff out, but I didn't, and, well. I was floored. *This is the best simile my tired brain can manage. Don't question me. The character development of Celaena was excellent. I'm still finding it hard to get fully behind her, though -- hello, she's an assassin -- but, though Crown of Midnight showed us her much darker, more animal side, it also showed more of her humanity. I am utterly confused in my feelings for her. I'd like to hear somebody really defend Celaena, and somebody else tear her apart ... anyone? The plot was excellent, although I had forgotten far more of Throne of Glass than I'd realised. Normally I'm fine with leaving months between books in a series and picking up where I left off, but I have to say I've got a little lost in Erilea's magic and ... stuff. I mean, there's magic, but there's also the force of Wyrd -- the ancient pagan concept of fate or destiny -- and there's witches and portals and parallel dimensions and ghosts and demons and riddles and ancient weapons and walking dead and ... well. I got a bit confused. It must be said. 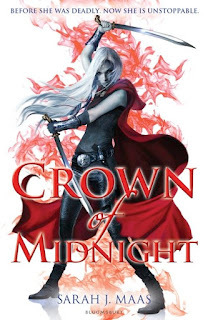 Still, I thoroughly enjoyed Crown of Midnight, and I can't wait to read Heir of Fire! Have you read any of these? What's the best thing you've recently read? Oh my goodness, I'm the same way. I started my blog to do book reviews...ha...I don't even remember the last one I did. Perhaps I shall take a leaf out of your book...I have never read any of these! They look great though, I shall check them out. Have an amazing weekend!! They are all great! I'd so recommend. Looks like some good books! I haven't read any of them, but Northanger Abbey has now moved up on my Jane Austen TBR list. That Sarah J. Maas series keeps showing up on the blogosphere... I haven't looked into it yet, and I'm undecided about whether I should. Thoughts? Oh, and I forgot to mention that I nominated you for the Infinity Dreams Blog Award: http://traceydyck.blogspot.ca/2015/09/the-infinity-dreams-blog-award.html It's entirely up to you whether you do it or not--I know some bloggers prefer not to participate, and that's okay! :) Just thought I'd let you know. Northanger isn't my fave Jane, but I loved it. It was lovely. Yes, go for ToG! I took a long time to actually start it -- it followed me around the blogosphere a lot, and eventually I gave into peer pressure. I'd definitely recommend, though.